“Aster et symphorine” by Pastel in Paris #ArtTuesday « Adafruit Industries – Makers, hackers, artists, designers and engineers! Beautiful new work from artist Francisco Diaz (also known as Pastel) up in Paris, via StreetArtNews. 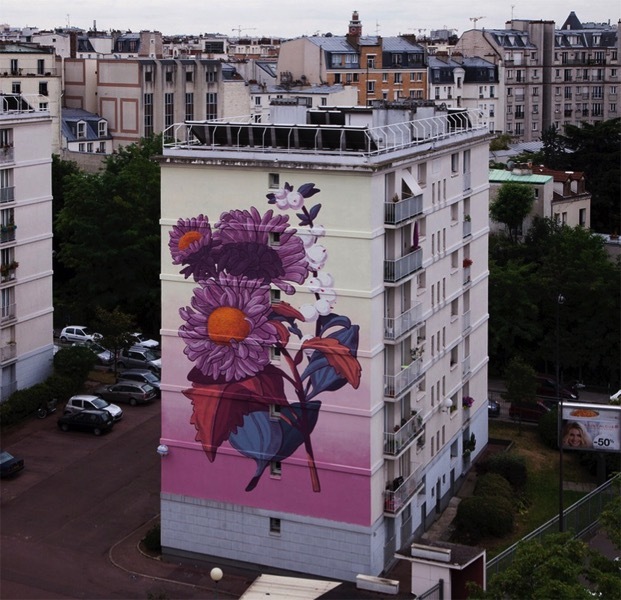 Entitled “Aster et symphorine” this superb mural is located in the 14ème arrondissement, on the facade of a building surrounded by “La petite ceinture”, an old dismissed bounding rail built in 1852 for load trains around the area. During the 30´s the Municipality of Paris decided to close the rails due to population growth and the dynamic complexity in urban terms of keeping such a solid border. Once abandoned, nature started to take prominence renewing the landscape´s identity.